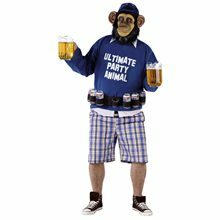 Ultimate Party Animal Plus Size Costume.Includes: "Ultimate Party Animal" top, blue plaid shorts, monkey chimp mask with backwards blue baseball cap, beverage belt with loop can holders and a shot glass to balance out the cans. 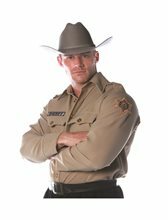 Available Size: Mens - Plus Size. (See Size Chart For More Information) *Beer Cans, Pitchers and Shoes Not Included. Accessories Sold Separately. 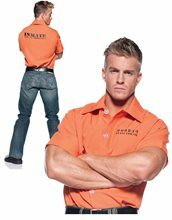 You'll be the Joe Cool of the Animal House party in our plus size Ultimate Party Animal Costume. Get the parties kicking into overdrive with your unique style! 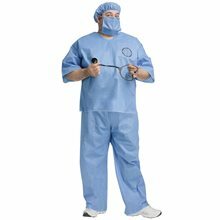 Our Ultimate Party Animal Funny Plus Size Costume includes a long-sleeve blue top with printed 'ULTIMATE PARTY ANIMAL' on chest, blue plaid shorts, monkey chimp mask with backwards blue baseball cap, black utility beverage belt with loop can holders and a shot glass to balance out the cans.